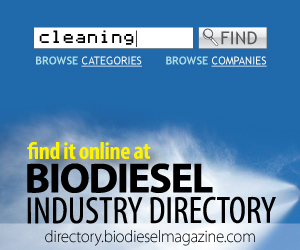 U.S. biodiesel production hit a record high in October, according to the Energy Information Administration. New EIA figures show 132 million gallons of biodiesel was produced in October, up from around 127 million gallons the month before. Under EPA's controversial proposed rulemaking for 2014 RFS volumes, 366 million advanced biofuel RINs may have to be demoted in 2014 RIN carryovers for use toward the general renewable category, Nick Paulson with farmdocDaily wrote in a recent post. Eleven representatives from the Nebraska Soybean Board recently joined more than 90 other representatives from the USB, the ASA and nine other state soybean boards in New York City to see how biodiesel and Bioheat are helping clean the city. A group of six governors from Iowa, Kansas, North Dakota, Minnesota, South Dakota and Nebraska sent a letter to the Obama administration expressing their opposition to the EPA's 2014 RFS proposal, which would hinder biodiesel and biofuels growth. The project, which includes the University of North Carolina and the University of Toledo, is part of a federal effort to tackle some of the fundamental problems in developing enough biofuels to provide up to 50 percent of U.S. transportation fuels. The authors discuss issues related to future costs of the LCFS and address provisions designed to keep compliance costs at reasonable levels. The analysis also addresses concerns over market power in the California fuel and credit markets, and more. In the offering, Methes sold 1.1 million units to select institutional and accredited investors, each unit consisting of one share of common stock and one warrant. Net proceeds from the offering were around $1.7 million, after deducting expenses.